How served: 750ml capped bottle poured into a Franziskaner weizen glass. I paired this beer with: Grilled salmon and grilled asparagus. This beer poured a clear golden color with a large 3 finger billowing head and left an nice thick lacing on the glass. The nose was very light with hints of bready yeast and orange zest. The taste started off with a light sweet wheat bready tasted then quickly bites you with some bitterness from the hops and orange zest taste. This beer had a medium long finish which was a moderately strong leaning towards the dry bitter side. The body was crisp with a light to medium body with a moderate level of lively carbonation. Overall the drinkability was good, but I wish I drank this brew 9 months ago. On the Label: Ever see bikes move faster than cars? You will on Saturday, March 31, 2012 in Tampa’s Downtown! Ever see bikes move faster than cars? You will on Saturday, March 31, 2012 in Tampa’s Downtown! Criterium Ale is a beer that we plan to change every year for the Cigar City Brewing Criterium & Street Festival. This year’s Criterium Ale is an American wheat ale with bitter curacao peel added. This American wheat ale is light gold in color and has a slight haze from the use of wheat. Criterium Ale is a crisp wheat beer that has a refreshing hop flavor that is contributed by New Zealand and Australian hop varietals. Motueka, Galaxy and Pacifica lend a complex melange of citrus character and mesh beautifully with bitter orange peel to provide a full flavored yet light refreshing beer. Pair this beer with food truck fare and cycling while sitting at the world’s longest bar. How served: 22oz capped bomber poured into a De Struise glass. I paired this beer with: a Rib-eye steak topped with A-1 bold and spicy sauce (Tabasco) and a side of Chickpea salad. You can almost never go wrong pairing an IPA with a steak, & this pairing was awesome! This beer poured an opaque amber orange with a 2 finger off white head, which dissipated slowly leaving a thin and sticky lacing on my glass. The nose was light with some citrus notes like orange and lemons mixed with sweet malts and caramel. The taste was not overpowering and started slightly hoppy/bitter with citrusy grapefruit rind notes and a pinch of pines, then was quickly balanced with a mildly sweet biscuit malty flavor and finished more on the dryer side. The body was light to medium body & and a nice level of carbonation. The drinkability was good as this was a light and refreshing IPA. This IPA might be one of the few IPA’s which those who say they do not like IPA’s might actually like!!! Overall, this was a great pairing with my steak, but as I.P.A’s go, it was just middle of the road. That’s not saying this beer wasn’t good, as it was, but there are many other I.P.A’s which I would much rather have. However if this beer was in front of me… down the hatch it would go & I would enjoy every drop of it! 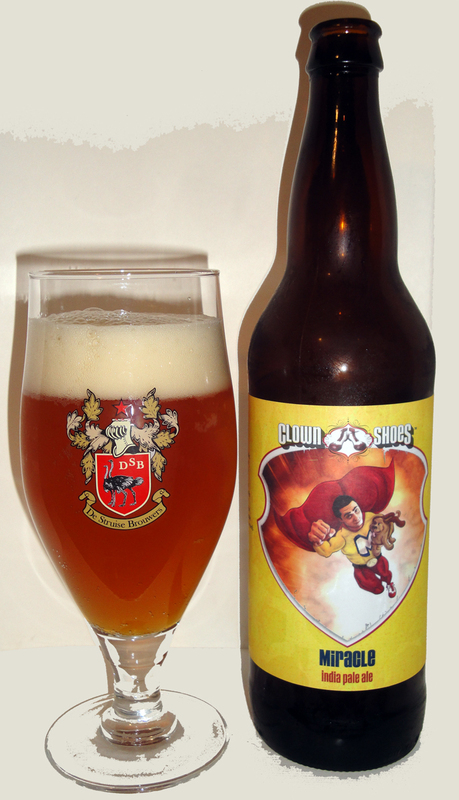 On the Label: Our boy Miracle Mike, represents the good we hope to do with the Clown Shoes Minor Miracle Fund. A percentage of the profits from this juicy sessionable IPA will be used to help real people (and maybe a puppy or two). From their website: Our boy Miracle Mike represents what we hope to do with our Minor Miracle Fund. A percentage of the profits from this juicy sessionable IPA will be used to help real people (and maybe a puppy or two). How served: 22 oz capped bottle poured into a Malheur glass. I paired this beer with: Giants vs 49er’s NFC Championship Game & leftover Ruth’s Chris Rib-eye steak and a potato knish. The beer poured a hazy orangey golden color with a 1 finger head which dissipated rather quickly leaving a mild lacing on the glass. The nose was sweet and malty / bready with some Belgian yeast notes and a hint of orange and spices. The taste was slightly sweet of bread crust, malt and orange. There was a slight musty flavor in the background with some spiciness and not much tartness from the Brettanomyces. The beer finished dry. The body was of a medium body with a low level of carbonation and very little effect from the alcohol. 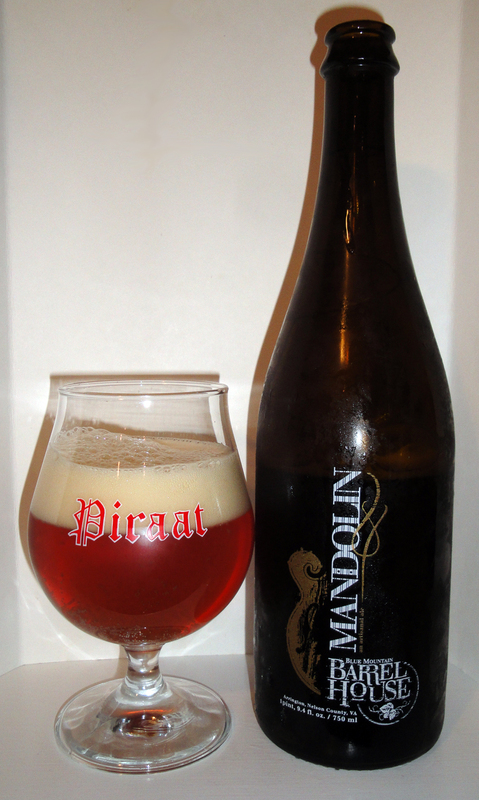 The drinkability was decent for a Belgian Strong Pale Ale. Pale Ale Re-Fermented with Brettanomyces. 7% Alcohol By Volume, 650 ml – 1 Pint 6 Fl OZ. Develops in the Bottle For Up To 5 Years. Contains Live Yeast. Sediment May Form. 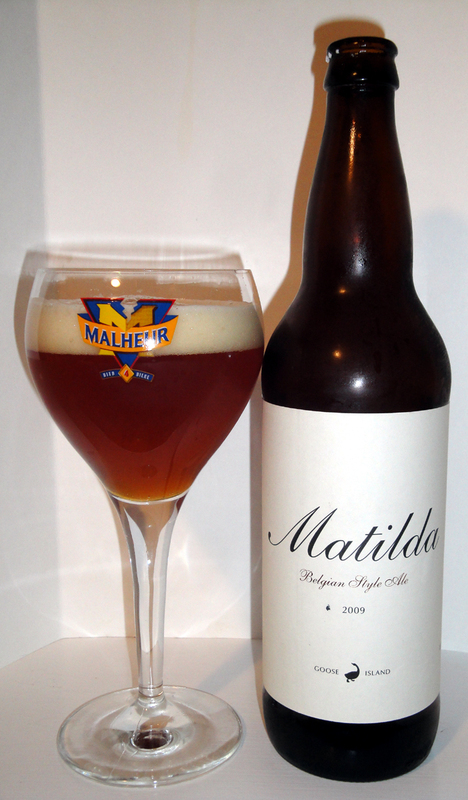 Food Pairings: Matilda pairs with many foods. Its spicy yeast flavors complement fresh mussels and contrast rich pork belly. How served: 22 oz capped bottle poured into a 3 Fonteinen glass. The beer poured a light & cloudy straw color with a large 3 finger billowing head with medium to large sized bubbles. The beer left a nice lacing on the glass. The nose was of faint sour apples and some earthy undertones. The body was light to medium body with the feel of champagne from all the carbonation. The drinkability was very good and this would be a good substitute for champagne at brunch time. Overall I rated this beer as Good, But I was torn between Good & Very Good and in the end I gave it a “Good” as it was more one dimensional. However YOU might think otherwise, so if you can Try it Yourself because it might end up being Very…..!!! You are holding something special – one of only 1,800 bottles released and numbers. Intrigued? Visit www.epicbrewing.com to explore this limited brew’s precise details. Sour Apple Saison-Style Ale Release #6 Brewed on June 6, 2011. Packaged July 7, 2011. This is a gorgeous saison, it has a nice mild sourness with a slight kick of apple and cinnamon. 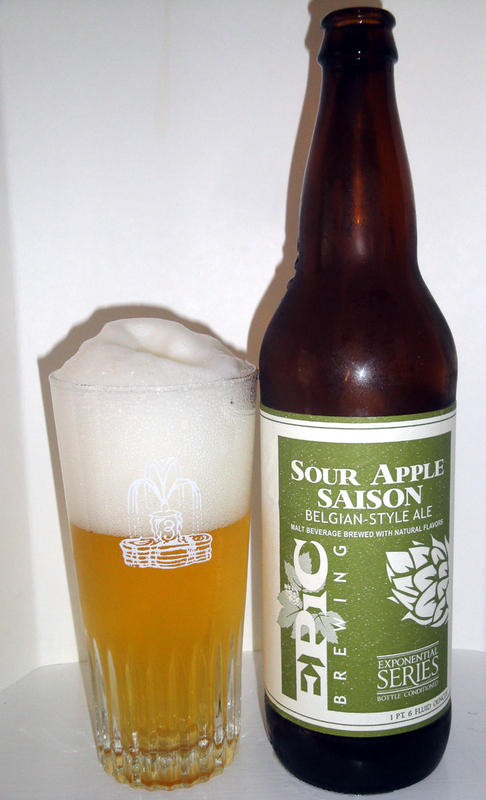 It has a very dry finish from the classic Saison yeast that gives it a little earthy, peppery and spiciness. Weyermann Pilsner is the base malt on this beer followed by Briess Flaked Oats and Muntons Wheat Malt. Saaz, Tettnang, ground Ginger, Cardamom, Cinnamon, Cloves, Nutmeg, Anise Seed, Grains of Paradise, and Coriander. WOW!! has it really been more than 3 months since I posted to my blog? Sorry about that… I need to get back to not just drinking my beers but posting them too!! How served: 750ml silver foiled corked and caged bottle poured into an Augustijn Grand Cru tulip. I paired this beer with: Salmon filet steamed inside a foiled bag on top of fennel and leeks, then served on a bed of couscous topped with a dollop of cucumber yogurt dill sauce. Boy this was a very yummy dinner and paired well with this beer!! This beer pours a cloudy light orange with a one finger off white head which left a thin lacing on my glass. The nose on this brew was very mild and vague. There were hints of bread, some very mild hints of a wet horse blanket and a little medicinal, otherwise the nose was unremarkable. The taste was also very mild or should I say short, as it went from the start to finish in record time! I got a very strong bready, malty and zesty spicy taste up front, then a mild bitterness near the end with nothing in between. There was nothing in this beer taste which would have suggested a “wild” side. This beer had a thin to medium body with a low to medium level of carbonation.. 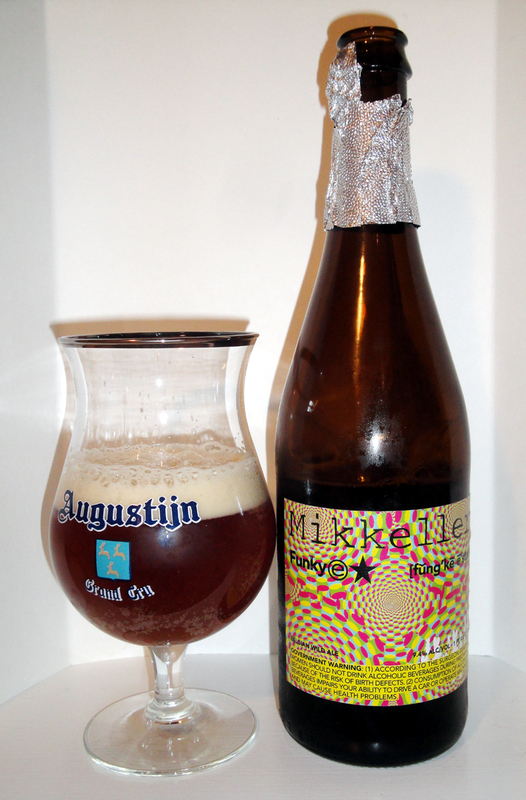 The drinkability of this “Funky E” brew was very good overall and there was only a mild hint of the 9+% abv. From their website: Nothing on their site on this brew! 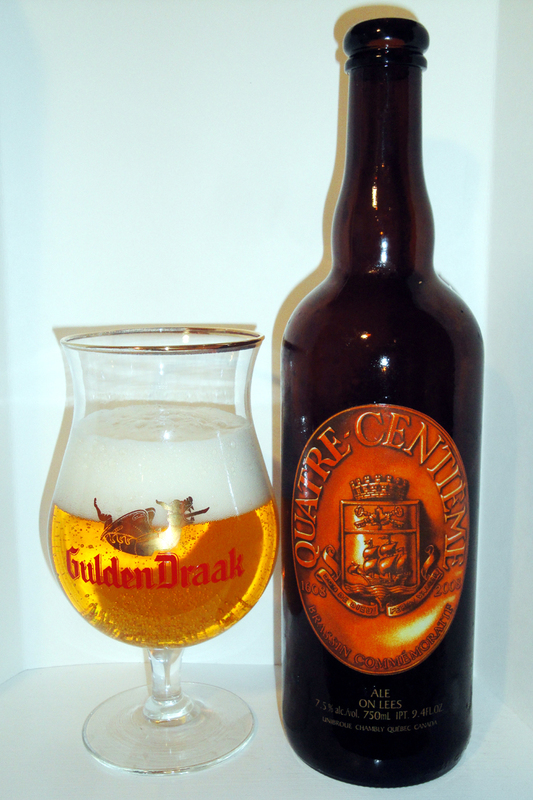 How served: 750 ml corked and caged bottle poured into a Gulden Draak tulip. 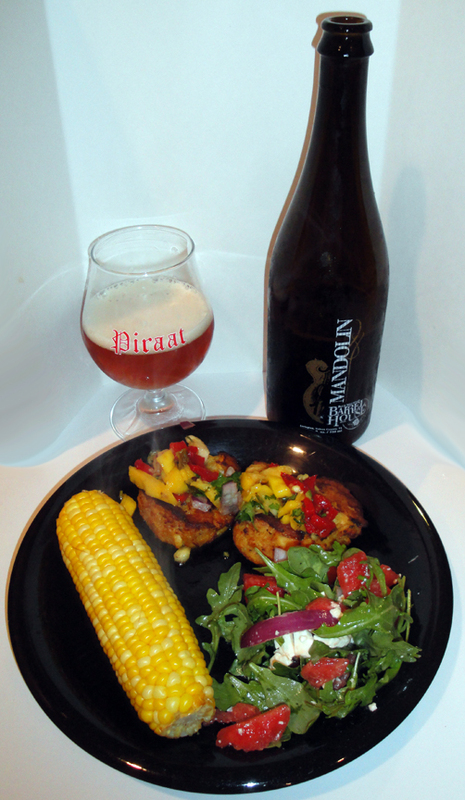 I paired this beer with: Grilled tilapia with tomatoes, rosemary, zucchini and black olives. Paired very well. Notes: I’ve had this beer sitting in my cellar for 2 years. It was 1st released in 2008 in celebration of the 400th anniversary of Quebec. The cork popped with a nice loud “pop” and poured a light golden yellow with a fluffy 2 finger head. There was a thin and small lacing left on my glass. The nose was sweet with lots of yeasty notes like bananas, lemons, cloves and some spices. This beer had medium mouthfeel and was quite refreshing with a pleasant carbonation level. The drinkability was as easy as it gets. Overall I felt that this was good beer and would recommend it to anyone who like a Belgian strong pale ale, but is not nearly as good as most of the other beers I’ve had from Unibroue. On the Label: In 2008, Quebéc City proudly celebrates four hundred years of settlements by people of different races and cultures. These pioneers built the first European city in this part of North America which became the gateway to the New World. In 1608, Samuel de Champlain arrived on a ship bearing the name Don de Dieu to establish a French colonial empire. He named the settlement Kebec, a native word meaning “where the river narrows”. This strategic location made it the scene of major battles that raged for over a century. Throughout this period and beyond, the city continued to grow attracting French, Scottish, Welsh, Irish and English settlers who enriched the community with a variety of traditions, customs, trades and professions creating a blend of cultures found nowhere else in the world. This exclusively brewed beer honours all those who have made “joie de vivre” synonymous with this amazing city! From their website: No information on their website on this brew, so I am assuming that this beer is no longer made.